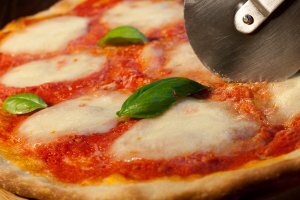 What Is the History of Margherita Pizza? Today, there are plenty of pizza places near Palo Alto , just as there are in every town across the U.S. and the world. Everyone knows that pizza can be traced back to Italy, but not everyone knows the detailed history of the world’s most popular food. No modern pizza—not Chicago pizza, not gluten-free pizza—would exist if it weren’t for a royal visit to Naples in 1889. To learn more about the history of pizza, read on. People around the world have enjoyed flatbreads for millennia, but the people who lived around the Mediterranean in ancient times had a special affinity for this food. Archaeologists and historians have discovered that the ancient Greeks and Sardinians ate flatbread topped with garlic, onions, olive oil, and herbs—ingredients that are still popular pizza toppings around the world to this day. Did you know that modern Italy was not a unified country until 1860? Before that, the peninsula was a collection of different states and kingdoms. Almost three decades later, King Umberto I and Queen Margherita went on tour in Naples, which used to be an independent kingdom. Her Majesty noticed the flatbreads that some local peasants were eating, and a famous Neapolitan chef prepared a special version for her that featured toppings in the colors of the flag of the recently unified Italy: Red tomatoes, fresh white mozzarella, and green basil. Thus the Margherita pizza was born. Shortly after the invention of the Margherita pizza, Italian immigrants brought this classic, hearty dish with them to the United States. The basic toppings stayed the same: tomatoes, cheese, and Italian herbs. The form of pizza would change as it made its way across the country: in some cities, different types of cheese other than mozzarella were used, and in some places simple crushed tomatoes were replaced with complex seasoned tomato sauces. Pizzerias in Chicago invented the now classic deep-dish style that is the signature dish of the Windy City.